Just getting to grips with my 1971 429 Cobra Jet Ram Air automatic mustang. Original condition with 52,000 miles. Has only covered 500 miles in the last 15 years as was part of a car collection. Full service, repaint and slight restoration 3 years ago. Trying to figure out, and hoping for advice please, as to whether anything is missing from the engine bay. The ram air flaps in the hood seem permanently open (I guess the actuators have long stopped working) and the air filter housing snorkel seems permanently closed. 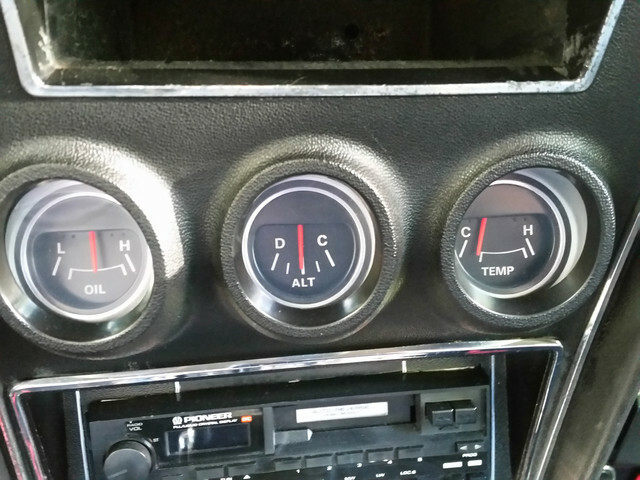 The gauges shown are at idle after a 10 mile warm up run. Oil pressure seems good though the temperature reading seems low. Are these the normal ones to expect? Ram air flaps are vacuum operated. They stay open until vacuum is applied. 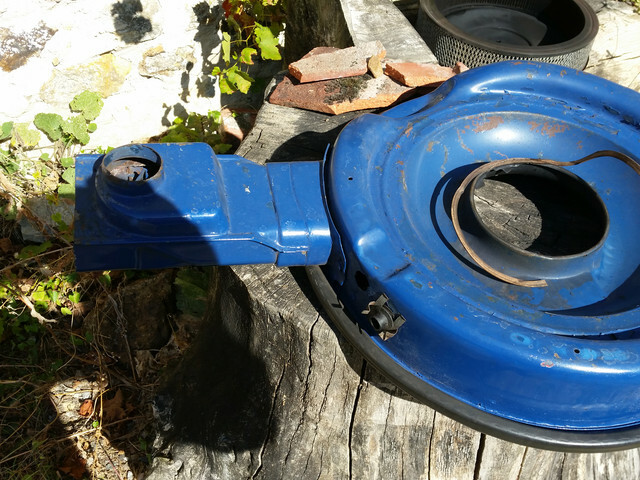 The diaphragms tend to fail with age, rebuild and repops are available. The snorkel flap is operated by a thermostatic actuator. The flap will stay closed until it is warmed by hot air from the heat stove on the manifold. I don't see a heat stove or the foil tube. Carb has been swapped, it's not the correct fuel bowl or line setup. Wiring has been messed with for certain. (10-02-2018, 11:39 AM)Hemikiller Wrote: Ram air flaps are vacuum operated. They stay open until vacuum is applied. The diaphragms tend to fail with age, rebuild and repops are available. I have come across that site and have tried comparing pictures there with mine. I'm still a bit confused, as an owner for less than a week, hence my asking. Yes the Rochester has been swapped out for the holley (not sure what model) because the PO couldn't get it to idle. It still won't idle cold but is fine when hot but a restart after maybe an hour still has her stumbling for a while. She certainly pulls hard on the run though. The original Rochester should have come with the car, but didn't, they're looking where it is and hopefully they will find it. My thinking about the snorkel and ram air must be the wrong way around. I thought the ram air was closed initially then opens when pressing the loud pedal to get cooler air from outside. Wonder what someone did with the wiring. Apart from a tape cassette player there's no additions that I'm aware of. I guess some of it perished with age and was replaced? Can I ask you if you think the gauges are reading corrected? Car is warm, in park and idling. The ram air flappers are closed by engine vacuum, high vacuum closes the flappers, stomp on it, vacuum goes way down and the flappers open. The oil pressure seems reasonable, temperature looks a little low. The thermostat may have been replaced by the previous owner with a 160° or it may be stuck open or missing. The sending unit may also be bad. Does the ammeter move when you turn the headlights and heater on, or when you increase the RPMs? The ammeters are known for not working well as they age, have the Rocketman's convert yours to a voltmeter. (10-02-2018, 01:10 PM)Don C Wrote: The ram air flappers are closed by engine vacuum, high vacuum closes the flappers, stomp on it, vacuum goes way down and the flappers open. So the flaps do open as I thought, just for the reverse reason with vacuum! I probably need to replace all the fluids as soon as I can really. Yes I wonder about the thermostat. Is the proper CJ one 195C? I've also seen a 180C one that's available too. Temperature sender is worth replacing for sure as well. I'll check the ammeter as you suggest. From memory I'm not sure it does move, well it stays in the centre but moves back and forth a little all the time. Along with what other's have pointed out here already: Should be a Quadrajet 715cfm carburetor along with the unique choke thermostatic pull down assembly. The wiring around the battery has been completely worked over... Appear to be missing the fuel vapor corrugated tubing that goes from the fuel vapor canister to the air cleaner. 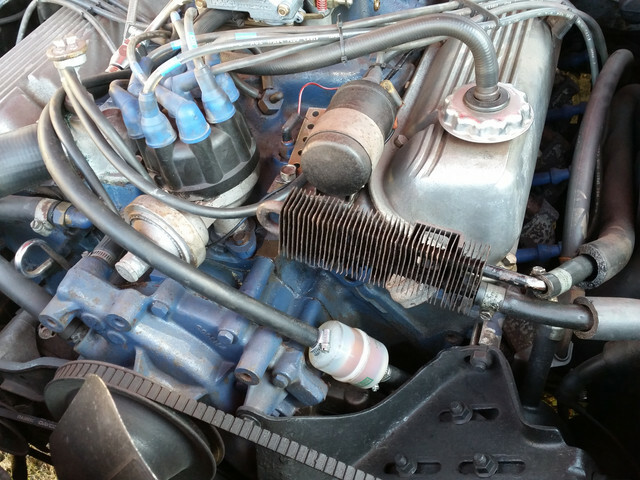 A host of other minor changes appear to have been done on the engine over the year's however, the distributor appears to be original, still incorporates the original looking EPVS valve on top of the thermostat housing, although the hard to find electrical connection that attaches to the top of this valve appears to be missing. I would ask was this car built in U.S. or over there. They did build there from kits and sometimes those are not just like in the U.S.. Figure out where it was built first. The Mexico cars are different also. (10-02-2018, 06:56 PM)Carolina_Mountain_Mustangs Wrote: I would ask was this car built in U.S. or over there. They did build there from kits and sometimes those are not just like in the U.S.. Figure out where it was built first. The Mexico cars are different also. The car was built at Dearborn on October 8th 1970 as a 1971 model for export to the UK so she never really ran on US soil. She did 38,000 miles in her first 6 years (so she was used) then another 7,000 in the next 8 years. Was then part of a static car collection for 10 years up until 4 years ago and has covered all of 130 miles since then. Had some resto 3 years ago (carb swapped, some welding, tyres, complete respray, servicing etc). I guess over the years some changes, deletions etc must have been done. Be good to get an idea as well, if possible, how any of these changes might affect how she drives? Gearbox is clunky (but I guess that would be usual?) and the cold idle is very poor - needs gentle gas to keep her from stalling out - but when warm she does seem to fly. 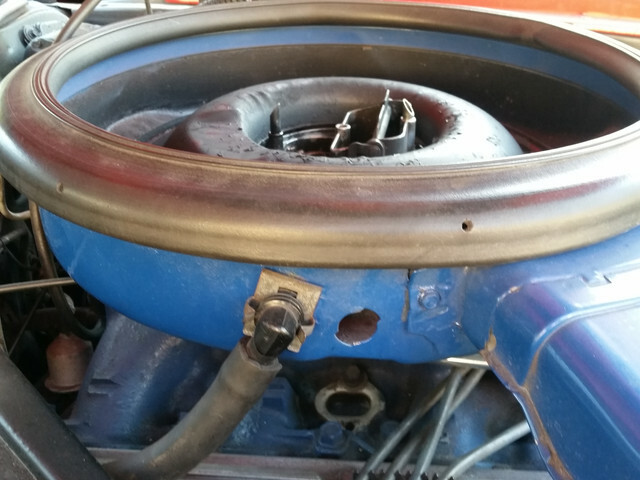 (10-02-2018, 05:16 PM)7173Vert Wrote: Along with what other's have pointed out here already: Should be a Quadrajet 715cfm carburetor along with the unique choke thermostatic pull down assembly. The wiring around the battery has been completely worked over... Appear to be missing the fuel vapor corrugated tubing that goes from the fuel vapor canister to the air cleaner. 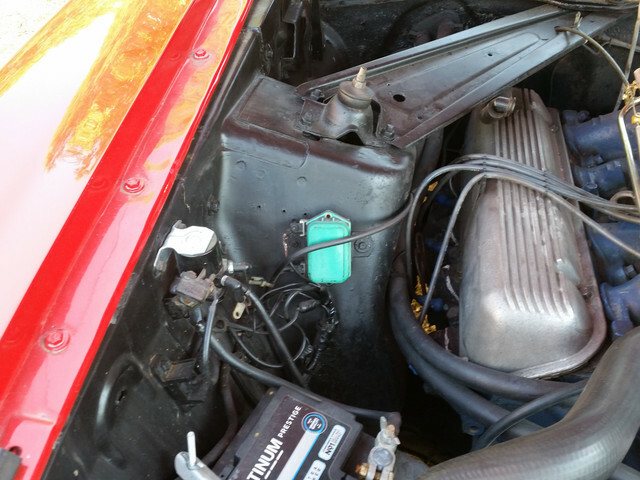 A host of other minor changes appear to have been done on the engine over the year's however, the distributor appears to be original, still incorporates the original looking EPVS valve on top of the thermostat housing, although the hard to find electrical connection that attaches to the top of this valve appears to be missing. Thanks. Yes, hopefully, I'll receive the original quadrajet - it should have come with the car. What effect, if any, would the missing parts have on the engine or its performance?